1. The 31st meeting of Standing Committee of Voluntary Agencies(SCOVA) of the Department of Pension & Pensioners’ Welfare is scheduled to be held shortly. The date, time and venue of the meeting will be intimated in due course. The meeting will be chaired by the Hon’ble Minister of State in the Ministry of Personnel, Public Grievances & Pensions. 2. It is therefore requested to suggest fresh items/issues, if any, for inclusion in the agenda to be discussed for the proposed meeting through c-mail/hard copy/fax. 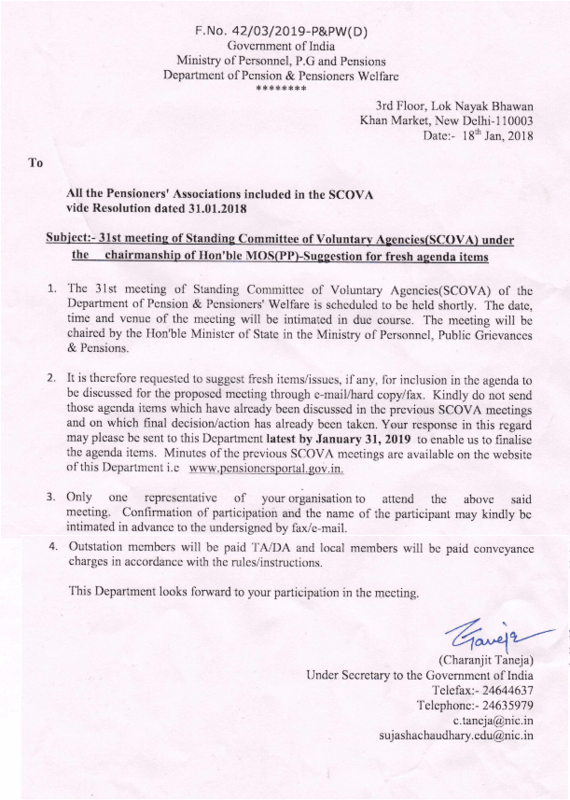 Kindly do not send those agenda items which have already been discussed in the previous SCOVA meetings and on which final decision/action has already been taken. Your response in this regard may please be sent to this Department latest by January 31, 2019 to enable us to finalise the agenda items. 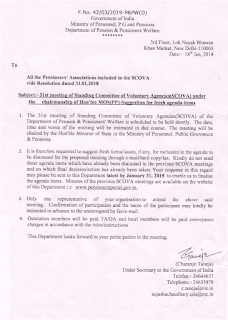 Minutes of the previous SCOVA meetings arc available on the website of this Department i.e www.pensionersportal.gov.in. 3. Only one representative of your organisation to attend the above said meeting. Confirmation of participation and the name of the participant may kindly be intimated in advance to the undersigned by fax/e-mail.